High Intensity Laser is revolutionary technology with high power up to 12W which allows deep tissue penetration for unlimited pain therapy. High Intensity Laser stimulates local microcirculation and supports lymph drainage of the pathological area. Combining biostimulation and photomechanical stimulation, the High Intensity Laser therapy actually heals the tissue while provides a powerful and non-addictive form of pain management. High Intensity Laser therapy device offers very effective treatment for wide range of clinical indications ranging from muscle injuries and tendinopathies to degenerative joint disorders. How Does High Intensity Laser Therapy Work? Thousands of research studies have helped us understand that when the cell is exposed to light of certain wavelengths, most of the biological processes occur at the cellular and DNA level. Be Pain Free’s laser therapy is non-surgical and painless and it penetrates through the skin and deep into the cells. This triggers biochemical reactions that increase cellular energy, increase oxygen levels and the re-growth of nerves and other damaged tissues. 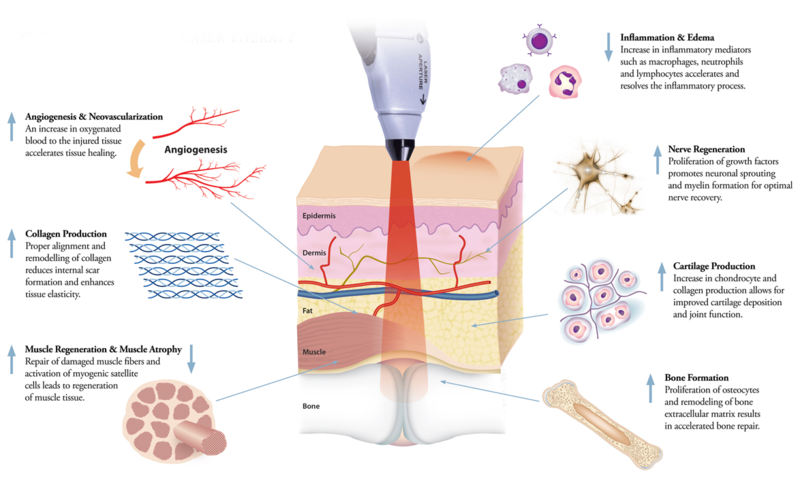 Due to the strong anti-inflammatory and anti-inflammatory effect on cell tissue, laser therapy has the potential to help where your body’s cells are not working to their optimum level. This means it can help repair tendons, ligaments and muscles faster and more efficiently. Any injury or degenerative condition that the body can heal, can potentially be enhanced with laser therapy. This is achieved by increasing energy production within the cells mitochondria. Energised cells work together more efficiently to increase the rate of healing.